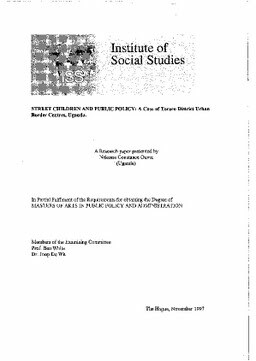 Erasmus University Thesis Repository: Street children and public policy: A Case of Tororo District Urban Border Centres, Uganda. Street children and public policy: A Case of Tororo District Urban Border Centres, Uganda. Children living as well as working in the streets is a common sight in almost all the cities of the world. They have been the subject of so many studies. They have been a topic of discussion at national, regional and international levels. Several programmes world-wide have been designed and developed with a view of reaching these children. Despite these actions and concern, are we (those involved in the actions as well as inactions) able to say we know these children very well? Where they come from (their background)? How many they are? Who are they? Where they are? What they do? Reactions and answers to this questions, which have been answered in one way or the other, reveal that the term does not mean the same and one thing to the users, whether at a policy, programme, or/and project levels, even in everyday use at local levels. This implies significant differences among conclusions and the eventual responses to these children all levels. Therefore any appropriate point of departure for a discussion on street children in any forum should begin with a viable definition of these children, although the task to come up with a definition has not been easy.